"Unfortunately, no one can be told what the Matrix is. You have to see it for yourself. " The original Matrix film was something of a force when it was originally released in 1999 to great reviews and stunned audiences. It was and still is a landmark film that takes the viewer into a world that had not been seen before on film. It is a visually exuberant exercise in filmmaking that gets better each time I watch it. Then, as if something this perfect could not be kept down, two sequels were shot together and released within six months in 2003, resulting in pale imitations of the original. Now, the films are together in a 10-disc (yikes!) set that will likely quench your thirst for everything Matrix. The only problem is that the Matrix films may not deserve all the lavish attention of this extraordinary set. My opinion has always been that the first film is a true landmark of new millennium filmmaking, while the remaining films are filler for a story that is never truly fleshed out. Watching The Matrix some five years after its release, its originality has sadly diminished thanks to the countless imitations that have come along, but it is hard to deny that there really is magic in it. The Wachowski brothers have crafted a film universe that is as original and astonishing as any that has come before. They also redefined the typical action film with their use of slow motion in the action scenes, including a veritable pause in the midst of action while the camera rotates around the character or set and then suddenly speeds up to bring everything back to speed. Known as "bullet time," this revolutionary use of stop-motion effect has now been overdone, but when The Matrix was released, it was something truly breathtaking. The film does dissolve into a more a straightforward action picture in its final half hour, but what comes before is thought-provoking and richly detailed. The Wachowskis create an intricate plot, and, most importantly, well thought out; in fact, they never give the viewer a reason to doubt what they are saying. The film is so wonderfully constructed that I would have gladly given up the extravagant lobby shoot out (which is amazing, by the way) for a solid conclusion that would have been deserving of the previous two hours. As it were, the answers that I so want can be found (partly) in The Matrix Reloaded (full review here), the long-awaited sequel that polarized audiences upon its release in 2003. The second installment in the trilogy reunites nearly everyone from the first film and deals largely with Morpheus and his band of rebels pushing for Zion, the last human city. But the agents are also hot on their trail and Agent Smith has a personal vendetta against Neo. As the agents move closer to Zion, Neo begins to have visions of a certain character's death while also struggling with his own inevitable demise. Add to this a string of new characters, including the Merovingian (Wilson) and his wife Persphone (Belucci), who are seductive but deadly. All of this is intermixed with a lot of discussion on the origins and meanings of the Matrix and a lot of overdone talk about Neo being the "chosen one." To be honest, the first time I saw the film I found the discussion rather boring, but upon further viewings the film�and its subject matter�have grown on me. Logically, the middle act of a three-part play would be filled with exposition that explains what happened before and what happens later. It is a bold move for the creators to take this route with what was undoubtedly the most anticipated sequel in a decade and it pays off�I can see it becoming my favorite of the series in the coming years. There are three terrific set pieces that are absolutely fantastic. The first is a battle between Neo and over a hundred Agent Smiths in which Neo fends them off with gravity-defying movements and a large metal pole. The piece does suffer from some bad CGI, but the fight is thrilling in its creativity and it is short and to the point. The next is a large fight between Neo and nearly a dozen of the Merovingian's best guards. The final and best is a stunning car chase that takes place on a freeway, built specifically for this scene, and involves cars and semis operated by Morpheus and his crew, many agents, and two fantastic dreadlocked brothers that work for Merovingian. The chase goes on for quite a while and is fought on the pavement, in the backseat of a car, and on top of a moving tractor trailer. The film ends with a cliffhanger that is rather boring considering what is expected, but over all, this sequel does answer some questions while also asking several more. The only problem was waiting for The Matrix Revolutions to answer them. And yet the third and final film fails to answer them in any way. Instead, it becomes an overblown action film that all abut abandons any of the intelligence that came before it. The Matrix Revolutions opens with Neo in a coma after his battle with the Sentinels in the finale of the second film. His state of limbo appears to be a train station that he can not leave. As Trinity and Morpheus enter an underground club they encounter resistance, as well as the Merovingian, and after a short battle they strike a deal to free Neo. Meanwhile, Agent Smith has entered the real world in human form and happens to be on his way to Zion, where the residents prepare to fight the Sentinels and make their last stand. The third film should be, by all accounts, the best, as we finally get the answers we have been waiting for since the start of the trilogy. Instead we are left to decide the answers for ourselves, sadly without much information to go on. Instead, focus is on the residents of Zion and the commanders and crews of the ships heading towards Zion in a last-minute effort to save the underground city. This is exciting, but the final installment should be heavily geared toward it protagonist, but instead,there is very little about Neo and his efforts to save mankind. The first film offered the Wachowski brothers limited control over their material. This was the studio's picture and it worked well in its balance. But with the sequels, the pair had unlimited control and it is clear that towards the end the project got away from them�their eyes were bigger than their imaginations, it seems. All of their ideas become overwhelming and they simply run out of time. Had the final film been in line with the first and second installments with deep story and terrific action, this may have been on the same level as other classic movie trilogies; instead, it damages the previous two films and therefore lessens the overall quality. Image Transfer Review: Much has been made of the brand new transfer for The Matrix and while you probably shouldn't believe the hype in that it is light years beyond the previous installment, it does come close. In this transfer the colors literally pop off the screen with terrific depth and vibrancy while the darker colors show no grain, but also having nice shadow detail. The remaining transfers are a bit better, though neither receives the massive overhaul that the first film got.Reloaded seems to be a tad more crisp and clear with improved detail in some of the fight scenes as well as those set in the darkened parts of the real world. Revolutions is the least improved with a virtual copy of the original release. Colors are still crisp and clear throughout with terrific sharpness and detail, while no edge enhancement or pixelation is noticeable. Audio Transfer Review: The films in The Matrix Trilogy have always featured reference quality Dolby Digital 5.1 mixes but what has always impressed me about the mixes isn't just the overly loud explosions and split surround effects, but the smaller more ambient sounds that litter the track. The score comes through crisply and clearly as do small sounds such as traffic, the sounds of the ships that the characters head towards Zion in, or simply the sounds the streets in the Matrix. If anything, the mixes are textbook examples of perfect sound mixing, as there is constant activity and when the action gets going the mixes come even more alive. The .1 LFE channel is consistently rich and deep throughout all three films with some serious room-shaking bass. Rock is Dead and Sleeping Awake by Marilyn Manson and P.O.D. Extras Review: Since this is the definitive version of The Matrix Trilogy it is only fitting that this set houses everything you could ever possibly want to know about the films and a lot more on top of that. Each of the films includes two audio commentary tracks, the first by Dr. Cornel West and Ken Wilier who discuss the philosophy of The Matrix. The second features three critics, Todd McCarthy from Variety, John Powers from Vogue, and author David Thompson. The first film includes only the pair of commentary tracks, which are informative and a pleasure to listen to. West and Wilber talk at length about the meaning of The Matrix and how elements of it deal with philosophy, and how some throwaway moments and shots are keys to the meaning of the film. This is a first-rate track that, while a tad too deep at times, does a nice job of revealing deeper meaning of the film. The critics track is, as one might expect, more lighthearted as the trio discuss influences for the film, how it turned sci-fi filmmaking on its end, and the style of the films. This is the better of the two tracks, though not by much. The second disc is a repackage of The Matrix Revisited and it is a deep and involving look at the making of the first film. We are treated to interviews with the cast and crew as well as a look at the production and just how some of the scenes were filmed, including the lobby shootout and the climactic helicopter and subway fight scenes. Also included are 41 music tracks that play in the background of the menu system, a cool feature if you like techno music. Take the Red Pill is a look at how the film's 'bullet time' sequences and some of the trickier special effects, including Neo's interaction with a mirror that begins to move up his skin were done, as well as the scenes set in the real world. The third disc features The Matrix Reloaded in its entirety as well as two more commentary tracks by the same groups that appeared on the first disc. The critics are brutal to the film for the most part as they talk about the expectations placed upon the sequel and how too much of the same thing from the first film ultimately killed this one. The philosophers talk at length about the changes in theory from the first to the second film, and address the growth of the characters and how they have evolved as the story gets deeper to its central meaning. The fourth disc houses The Matrix Reloaded Revisited, which is a collection of featurettes that describe everything about the making of the second film. The most substantial extra feature is a look at the Enter The Matrix video game and 23 live-action sequences that were shot solely for the video game. The events that transpire occur parallel to the events in the film, so I have to wonder why they were not just edited back into the finished film for this set. The next three pieces dissect three of the large action sequences in the film, beginning with the freeway chase scene. Everything is chronicled here including the construction of the set to storyboards that had to be incredibly detailed since there would sometimes only be one take of a given scene. The most interesting parts of this documentary are the construction of the road and a comparison at the end that shows both the final shot and the storyboards. The next documentary takes the viewer inside the Great Hall scene inside Merovingian's castle. This is a rather standard piece that chronicles again the construction of the set as well the filming. But here we also get a look at the life of one of the actors who plays an integral part in the scene. Chen Hu 's brief section shows his preparation for the part. We also get a tour of the set and a look at some of the medieval weapons that populate the great hall. There is a look at the Burly Brawl, the now famous scene in which Neo fights over a hundred Agent Smiths. The scene is broken down into computer models, storyboards, and wire work, as well as a look at the stand-ins and stunt men that worked in the scene. This documentary is interesting because it delves into the replacement of each actor in favor of a computer-generated version of both Reeves and Weaving; it is becoming scary just how perfect these computer models can be. Finally, there is a look at the Merovingian's gang including his wife (Belucci) and the two dreadlocked twins. On the disc that houses The Matrix Revolutions the pair of commentary tracks are by this point are wearing thin. The critics are not kind to the final film, at times attacking its over-the-top action and wooden dialogue; there are a few moments where a chuckle can be heard. The philosophers tend to care for the third installment quite a bit, though,not surprising given the heavy overtones of chance, fate, and destiny. The Matrix Revolutions Revisited is, like its predecessors, an in-depth look at the making of the third film. The documentary begins with a look at the production team, including the production designer, cinematographer, and gaffer discussing their efforts. This is a nice collection of interviews that helps to show the scope of the production, as cinematographer Pope proclaims that the two sequels had well over seven hundred scenes to film. Next we go inside Club Hel, the upside down club where Morpheus, Trinity, and Seraph fight at the start of the third film. We see everything from how the wire work was done, to set design, and finally stunts. This is a fun look at one of the best scenes in the film. The final battle between Neo and Smith is looked at in the next piece of the documentary as Reeves, Weaving, and the stunt men talk about the filming in pounding rain, and how everything seamlessly came together in post production. Aftermath looks at the end of The Matrix and how it has changed everyone involved. Composer Don Davis discusses his choice of style in his score and the inclusion of a more sentimental tone in light of the revelations that come between Neo and Trinity, as well as the final stand by the residents of Zion. Disc 7 is simply a repackaging of The Animatrix, of which my full review can be found here. The final three discs each house a different sort of look at the film, covering everything from trailers and media to the roots of the film in science and philosophy. 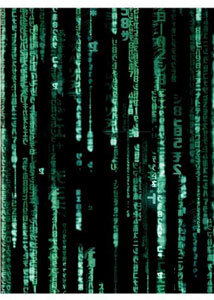 The Roots of The Matrix looks at the films beliefs and how they interplay with religion and philosophy. Several renowned scholars and philosophers discuss the themes present in the scripts. This is all well and good, but it's just not that interesting to me—I enjoy the theories in context, but this is taking it a tad too far. The next documentary is titled The Hard Problem: The Science Behind the Fiction and looks at the theory that the Matrix really could happen. Maybe not in this lifetime, but hey you never know. The documentary looks at the technology that exists in the films and whether or not it is in fact believable in todays world. The most interesting aspect of this piece are how some scientists feel that todays video games may in fact lead to some of the events that occurred in The Matrix. Disc 9 houses The Burly Man Chronicles, a look at the production of the two sequels from start to finish, and there is a lot covered here, mainly the cast and crew and advisors that were on the set during production. Everyone from storyboard artists, lesser known actors, and so on talk about the making of the films from the set design to the final shot on the final day. There is also a section that offers tributes to those that passed away during production, including Gloria Foster, the original Oracle. The final disc is The Zion Archive, a collection of trailers, TV spots, and music videos. The two videos are for Rock Is Dead and Sleeping Awake by Marilyn Manson and P.O.D., respectively. Overall, The Ultimate Matrix Collection is a terrific set that will answer all of your questions when it comes to how the films were made, but alas, there are no revelations about the script itself. This is a great look at the technical side of filmmaking with some in-depth extra features and a wonderful new transfer for the groundbreaking first film. It's a set that will please both fans, and if you've been waiting to collect everything related to The Matrix on DVD, here is your chance. For yhose of you, this set is highly recommended.